Losing Lake Michigan one Light Bulb at a Time | Broadview Collaborative, Inc. When you use electricity, what do you think of? When I turn on a light, or hear the dehumidifier humming in the basement, I might think about carbon dioxide emissions, or streams that are impacted near the coal fields of my mother’s home state of West Virginia. Maybe I think about my next electric bill. But one thing that’s for certain: I think about how much water is being used with every kilowatt hour of electricity that I use. Our home’s electricity is purchased from WE Energies, the major energy utility for southeastern Wisconsin. On the days when I commute to my office at Wingspread, I pass the Oak Creek generating site has six coal-fired generating units capable of 2,300 megawatts of electricity. Atop these plants, day or night, I see a large plume of steam rising into the sky from the facility’s cooling operation. Every drop of steam going up into the air represents part of the water-energy collision that has long been obvious to me intuitively, but has now been quantified and explained more fully as a result of a new body of work from the Union of Concerned Scientists (UCS). UCS has a long and impressive history studying the impacts of energy use, but four years ago UCS’s Chief Scientist Dr. Peter Frumhoff participated in The Johnson Foundation’s first Freshwater Forum and had a realization that water was an important part of the energy and climate change equation he had spent his career studying. A few months later, in November 2009, UCS launched what became its “Energy and Water in a Warming World” initiative with another convening hosted by The Johnson Foundation. Last week I had the good fortune to re-convene with many of those same people as UCS begins to wrap up three-and-a-half years studying the impact that electricity production has on our water resources. We’ll be hearing more about this when the final report is released in July, but they’ve created a series of interim products which can be found on their website. One of those interim reports, a 2011 study titled “Freshwater Use by U.S. Power Plants” indicates that in 2008 thermoelectric power plants withdrew somewhere between 60 billion and 170 billion gallons of freshwater, of which roughly 4% was “consumed” rather than returned to the water supply. Of course the water that is returned is warmer, has fewer fish and fish larvae, and so on, but that’s another story for another day. Their numbers got me thinking about “my” power plant along the shores of Lake Michigan. Lake levels have been dropping in recent years due to a tangled and contentious knot of contributing factors, but what role does electric power generation play? According to WE Energies’ reports, the Oak Creek facilities use up to 1.56 million gallons of water every minute. That’s right, every minute. That’s about 820 billion gallons per year. Their material also states that the water is returned to Lake Michigan after it is used, but my eyes tell me that at least some of it goes up into the air as steam. If 4% of that is ‘consumed’ (a reasonable average based on UCS’s numbers), that would translate into (up to) 32.8 billion gallons per year from Lake Michigan that is lost in steam. But what does that mean for Lake Michigan? It’s a big lake, after all. Wikipedia tells me that the lake has a surface area of 22,300 square miles. Converting gallons to acre-inches (0.0000368 acre inches per gallon), and square miles to acres (640 acres per square mile), I calculated that Lake Michigan loses up to 0.085 inches of depth per year, or just less than a tenth of an inch, thanks to the electricity that our region purchases from Oak Creek’s operations. So, does a tenth of an inch per year matter? 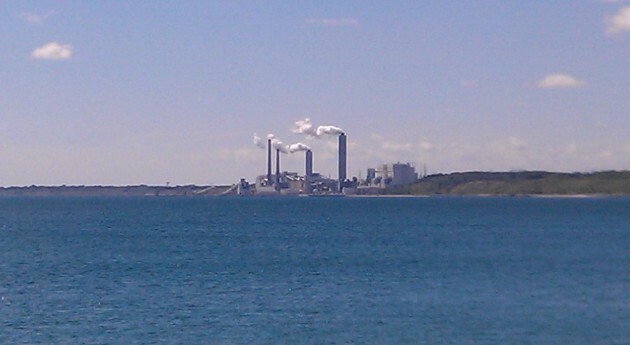 I’m not sure, but of course there are other power plants around Lake Michigan. According to the maps at GLEAM (Great Lakes Environmental Assessment and Mapping Project) there are eight power plants on Lake Michigan, not including nearby smaller power plants on tributaries. So, eight plants of varying sizes might collectively add up to a quarter or half an inch per year lost from Lake Michigan. But multiply that out by fifty years and see where that leads. A foot? Two feet? There are a lot of assumptions and estimates thrown in here, but my scrap paper calculations make me think there’s something to these numbers. With lake levels at all-time lows, it seems to me that it’s yet one more reason to re-think our energy portfolio.